The winning firms, known collectively as the “general engineering consultant,” would act as something of a shadow government for the Maryland Department of Transportation, which says its plan to hire firms to build, finance and maintain toll lanes is too big and complex to govern itself. 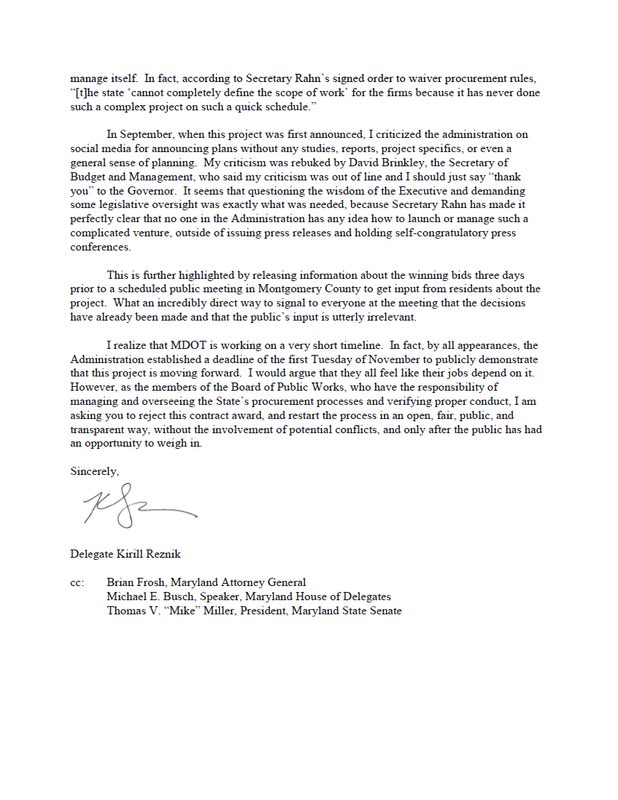 Referring to much of the above, Delegate Reznik said he was “incredibly alarmed” and asked the Board of Public Works to “restart the process in an open, fair, public, and transparent way, without the involvement of potential conflicts, and only after the public has had an opportunity to weigh in.” We reprint his letter below. A looming crisis threatens to devastate Maryland’s transportation program. As much as one-third of the state’s transportation project spending could be at risk. Key projects will be delayed, perhaps some indefinitely. 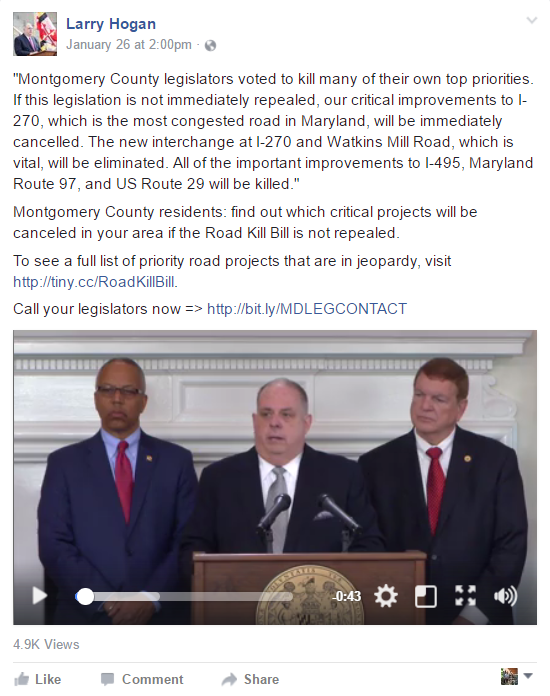 Is this because of the transportation transparency law that Governor Larry Hogan wants repealed? No, not at all. The real problem is something much more mundane, something Hogan does not want to talk about: a gaping budget hole. The Transportation Trust Fund (TTF) is a segregated fund used to finance Maryland’s transportation programs. Its largest sources of revenue are motor fuel taxes, titling taxes, registration fees and other Motor Vehicle Administration fees. It also receives a substantial amount of federal funding. 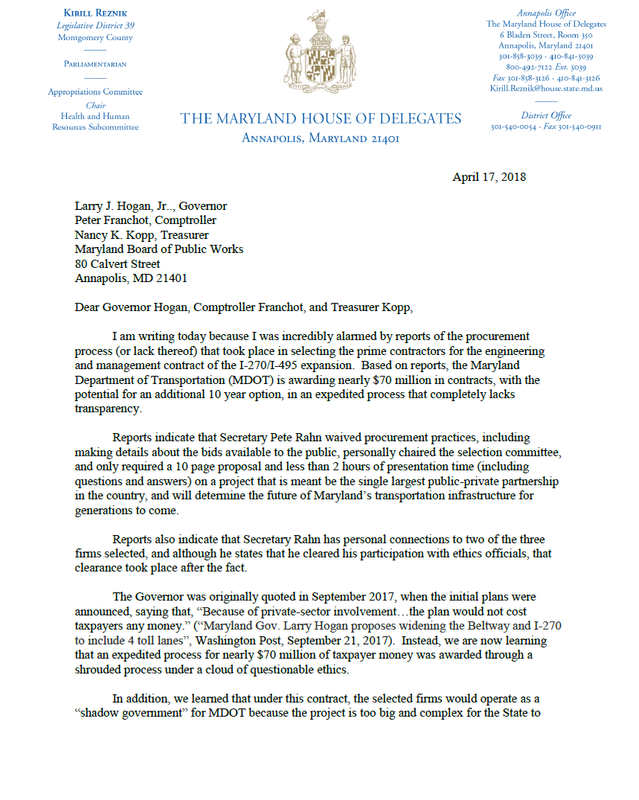 Its proceeds are used to finance the Maryland Department of Transportation’s (MDOT) operating expenses as well as MDOT’s debt service and six-year capital program. This means that funding for transportation capital projects is subject to variations in TTF revenue as well as changes in MDOT’s operating costs and debt service. The six-year State capital program in the Maryland Department of Transportation (MDOT) fiscal 2017 through 2022 Transportation Trust Fund (TTF) forecast is $1.5 billion lower than in the prior year’s six-year program. Lower estimated revenue attainment, primarily motor vehicle fuel tax revenue, accounts for about half the decrease with higher projections for debt service and departmental operating expense spending accounting for the other half of the reduction in the capital program. MDOT did not use the five-year average annual increase in operating expenses to calculate out-year operating expenses as directed in the 2016 Joint Chairmen’s Report. 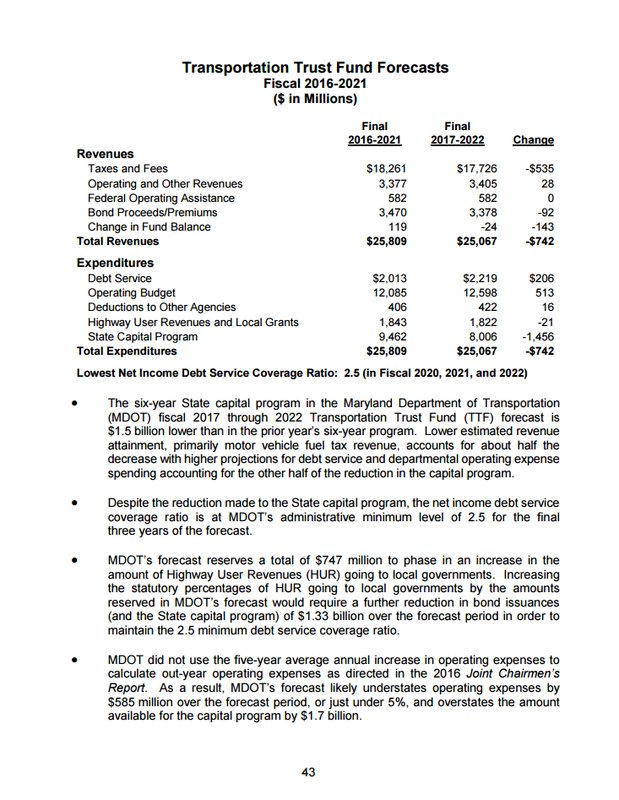 As a result, MDOT’s forecast likely understates operating expenses by $585 million over the forecast period, or just under 5%, and overstates the amount available for the capital program by $1.7 billion. Translation: $1.5 billion in forecasted transportation spending, or 15% of the state’s six-year total, has disappeared in one year. And the administration’s underestimating of MDOT’s operating expenses could cause the capital program to drop another $1.7 billion. That’s right, folks: one-third of all funding for state transportation projects could be evaporating. Now let’s be fair. Governor Hogan does not control revenues for transportation, which are chiefly determined by the state of the economy. Their substantial drop suggests that the economy is not doing as well as Hogan says it is. The economy could get even worse if Republicans in Washington repeal the Affordable Care Act – something that would cost Maryland tens of thousands of jobs – and push through substantial cuts to federal agencies. The Governor is also only in partial control of MDOT’s operating expenses, which include substantial amounts of materials and supplies purchased from private vendors. Those expenses are squeezing money for transportation along with the revenue shortfalls. But one thing the Governor does control is his own behavior. A reasonable Governor acting in good faith would go to the General Assembly and say, “Look folks. We have a problem here. Let’s get together and figure out how to deal with it.” That would be in line with the Governor’s regular calls for bipartisan cooperation. Instead, the Governor has launched a Holy War against the General Assembly’s transportation transparency law, which merely requires him to justify the projects he chooses to fund. He falsely claims that the law would require him to cancel projects when it does no such thing and even announced funding for one project a week after he said it would be killed. Instead of working with members of the General Assembly to remedy a real budget problem that threatens transportation projects, he assaults them on Facebook about a fake problem that he has made up. One of several Facebook posts the Governor is using to target state legislators. It’s a scam, folks. This Governor does not want to deal with an impending transportation crisis that is happening on his watch. Instead, he is trying everything in his power to shift blame to Democrats in the state legislature. Is Larry Hogan Capable of Telling the Truth? It’s easier to tell the truth than it is to lie. That’s because when you tell the truth, there’s only one version to remember. But when you lie, you have to keep all the details straight and say it the same way every time. Otherwise, you’ll get caught! Governor Larry Hogan has probably never heard of this. As we have noted before, the Governor is waging an all-out campaign to repeal the General Assembly’s transportation project scoring law. The law requires the Maryland Department of Transportation (MDOT) to score every major state transportation project on a variety of criteria, but gives the administration ultimate authority to fund projects of its choice regardless of their scores. The Governor despises the law because it creates potential for embarrassment – he would have to publicly defend any decisions to fund low-scoring projects. So he has falsely claimed that the law requires him to kill projects and said falsely that it was passed without hearings. The Governor even released a list of projects that the law would allegedly kill even though the plain language of the law contradicts him. Maryland Gov. Larry Hogan came to Hagerstown bearing gifts on Thursday, announcing more than $115 million in funding commitments for local and regional projects. The largest chunk, $105 million, is for the first phase of widening of Interstate 81, which recently got underway to widen the heavily-traveled interstate to six lanes from the West Virginia line to Md. 63 near Williamsport. Another $5 million has been budgeted for design work for the second phase of I-81 widening, Hogan said, allowing the project to progress north to the Interstate 70 interchange. The Governor’s office issued a press statement reiterating that work on I-81 would proceed. Neither the Herald-Mail article nor the press statement noted that the Governor had already said that I-81 would be killed by the transportation scoring law. There were no caveats in the article or the press statement such as “I-81 will proceed so long as the scoring law is repealed.” Let’s note that the project kill list and the press statement about I-81 were issued only EIGHT DAYS APART. In which of two alternate realities does the Governor live? The one in which a major transportation project is killed by a new law? Or the one in which the project proceeds without obstruction? It seems to vary by the day. This is no longer about transportation policy, folks. You can’t rant and rave at a press conference that a project is going to be killed and then show up a week later like Santa Claus to announce that it’s going to be built. Reasonable, sane and trustworthy people don’t behave like that regardless of their political beliefs. That raises a critical question. One of the reasons why Donald Trump was elected President is that he made things up out of thin air and the press, for the most part, let him get away with it. Now Governor Larry Hogan is doing the same thing. And so far, it’s working. So just like Trump, the Governor is making things up and trotting them out to the press. How did the press react? Erin Cox of the Baltimore Sun got the facts right, quoting both the law’s language and an advisory letter from the Attorney General’s office to demonstrate that Hogan is wrong. A reader had to review the article carefully to glean these things, however, as it also included lots of back-and-forth between politicians. The Washington Post and the Capital Gazette also quoted the law’s language, though only in passing. Other press outlets got suckered. The Hagerstown Herald-Mail, Frederick News-Post, Ocean City Today, WMAR (Baltimore), WJLA (Washington), Bethesda Magazine, Afro-American, WMDT, WTOP and Montgomery Community Media (MCM) never mention what the law actually says, depicting the issue as a he-said-she-said dispute between politicians. Ocean City Today, WJLA and WMDT never bothered to quote any Democrats, giving the Governor free rein. WJLA, WMAR, MCM and the Afro-American stated falsely that certain transportation projects either “were,” “will be” or “have been” canceled. Again, the law says no such thing and a simple fact-check could have uncovered that. The real story here is that one side is accurately characterizing state law and the other side is making stuff up. No one in the press wrote that story. Even more incredibly, the Governor said in his press conference about the law that the General Assembly “rammed it through without hearings or any public input.” You can see that in the video below at the -10:40 mark. 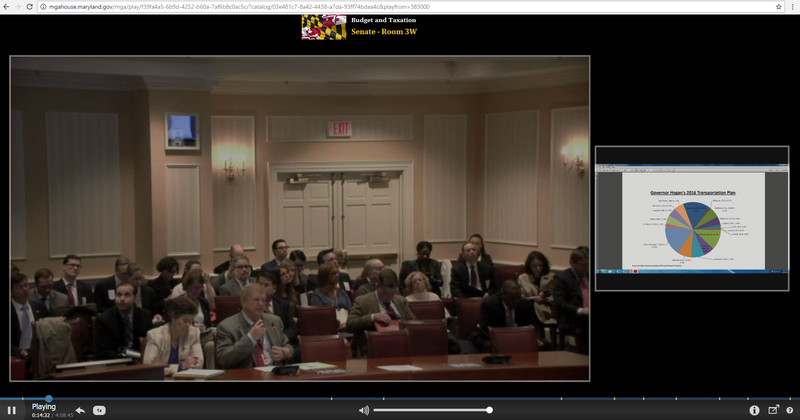 In fact, video of the hearings in both the Senate and the House are available on the General Assembly’s website. Pete Rahn, the Governor’s Secretary of Transportation, attended both. This is a pants-on-fire lie that no press outlet exposed. Secretary of Transportation Pete Rahn testifying at the Senate hearing that Governor Hogan says never happened. For a person who is known as not being a fan of Donald Trump, the Governor is remarkably quick to embrace his tactics: make stuff up, ignore the truth and bully anyone who disagrees. Most of the press is letting him get away with it. Everyone knows that elected officials sometimes disagree on issues. They may have differences of philosophy or values. They may emphasize different sets of conflicting data. They may prioritize one thing over another. But how many of them actually make stuff up and use that as a basis for policy arguments? One does. His name is Larry Hogan. Sounds harmless, yeah? Not to Governor Hogan. He is calling the law “the Road Kill Bill” and has released a huge list of transportation projects it would allegedly cancel. The Governor said in a public statement that the law was a “disastrous bill which will absolutely be responsible for the elimination of nearly all of the most important transportation priorities in every single jurisdiction all across the state… It will wreak havoc on the entire state transportation system and usurp important authority away from local governments and away from the executive branch of state government, giving authority instead to lobbyists and special interest groups.” He has launched a fierce social media campaign to repeal it. And yet the plain language of the law itself would not kill any transportation projects. Not a single one. Think that’s bad enough? It’s even worse. One of the projects the Governor says the law would kill is the Watkins Mill/I-270 interchange in Gaithersburg. This is a top priority for MoCo’s state legislators and was a significant reason for their support of a 2013 transportation funding increase. And yet the Hogan administration indefinitely postponed it and later mulled cutting exit ramps to save money. Only after the MoCo delegation introduced legislation to mandate funding the project did MDOT relent and reluctantly put it back on track. And now the Governor is falsely blaming the transportation scoring law for killing a project that his own administration tried to kill! Folks, what we have here is not a failure to communicate. It is a failure to live in reality. The Governor’s attacks on this law are contradicted by the plain language of the law itself. It does not kill ANY projects. In fact, it explicitly preserves MDOT’s ability to decide which projects get funded. This dispute is not about killing projects at all. What it’s really about is that the Governor can’t stand any law that subjects his decisions to public scrutiny. And this concept is so alien to him that he is willing to make false statements in public about what the law actually does. This is not a matter of right vs left or Democrats vs Republicans. It’s a matter of making stuff up to justify what you want. Now what other soon-to-be GOP officeholder does this remind you of?